This post has nothing to with cartoons or humorous illustration...it's just something that I wanted to write in honor of my friend and neighbor, Delbert Nelson...and after doing so, thought I'd share it here. 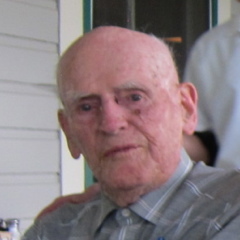 "Mr. Nelson" as we call him, just celebrated his 103rd birthday the other day. The man is amazing...sharp, terrific sense of humor, walks and exercises...he even drives his car to get a cup of coffee every morning! You know, the thing about him driving his car daily is maybe the most incredible of all. Along with his relatives, I was unsure about it after he turned 100, and when I tell people about it now, they are often concerned. I wouldn't want to see him navigate a high speed car chase, but he is very good. I see him out driving fairly often and he does not stick out -- no bad moves, doesn't drive slowly or too fast, he makes good decisions, (never drives in rain, snow or ice -- good thing snow usually melts here within 24 hours of falling), and uses his turn signals. His vision and reflexes somehow are just fine. Last week, his regular parking spot in front of his house was taken, so he found a spot half a block down that was tiny...allowing maybe a foot of space in front and back, (not much, and less than I would try to handle while parallel parking.) He just deftly pulled his Buick in and made two adjustments ahead and back, never coming close to bumping into the other cars. His driver's license expired a little over a year ago, (he missed the renewal date). When he went to the DMV to get it straightened out, the people there realized how old he was. They told him he would have to take vision tests, written tests and a full driving test if he wanted his license. He was a little worried, but agreed to try. --He passed them all.